Red Ruthenia or Red Rus' (Latin: Ruthenia Rubra; Russia Rubra; Ukrainian: Червона Русь, translit. Chervona Rus'; Polish: Ruś Czerwona, Ruś Halicka; Russian: Червонная Русь, translit. Chervonnaya Rus') is a term used since the Middle Ages for a region now comprising south-eastern Poland and adjoining parts of western Ukraine. It has also sometimes included parts of Lesser Poland, Podolia, "Right-bank Ukraine" and Volhynia. Centred on Przemyśl (Peremyshl), it has included major cities such as: Chełm, Zamość, Rzeszów, Krosno and Sanok (now all in Poland), as well as Lviv and Ternopil (in Ukraine). First mentioned by that name in a Polish chronicle of 1321, Red Ruthenia was the portion of Ruthenia incorporated into Poland by Casimir the Great during the 14th century. The disintegration of Rus', Red Ruthenia was contested by the Grand Duchy of Lithuania (the Gediminids), the Kingdom of Poland (the Piasts), the Kingdom of Hungary and the Kingdom of Ruthenia. After the Galicia–Volhynia Wars, for about 400 years most of Red Ruthenia became part of Poland as the Ruthenian Voivodeship. A minority of ethnic Poles have lived since the beginning of the second Millennium in northern parts of Red Ruthenia. The exonym "Ruthenians" usually refers to members of the Rusyn ethnic and/or Ukrainians. Lemkos in folk costumes from Mokre, near Sanok. The first known inhabitants of northern Red Ruthenia were Lendians, while subgroups of Rusyns, such as Boykos and Lemkos, lived in the south. Later Walddeutsche ("Forest Germans"), Jews, Armenians and Poles also made up part of the population. According to Marcin Bielski, although Bolesław I Chrobry settled Germans in the region to defend the borders against Hungary and Kievan Rus' the settlers became farmers. Maciej Stryjkowski described German peasants near Rzeszów, Przemyśl, Sanok, and Jarosław as good farmers. Casimir the Great settled German citizens on the borders of Lesser Poland and Red Ruthenia to join the acquired territory with the rest of his kingdom. In determining the population of late medieval Poland, colonisation and Polish migration to Red Ruthenia, Spiš and Podlachia (whom the Ukrainians called Mazury—poor peasant migrants, chiefly from Mazowsze) should be considered. During the second half of the 14th century, the Vlachs arrived from the southeastern Carpathians and quickly overspread southern Red Ruthenia. 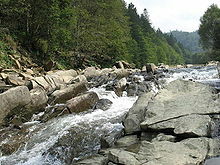 Although during the 15th century the Ruthenians gained a foothold, it was not until the 16th century that the Wallachian population in the Bieszczady Mountains and the Lower Beskids was Ruthenized. From the 14th to the 16th centuries Red Ruthenia underwent rapid urbanization, resulting in over 200 new towns built on the German model (virtually unknown before 1340, when Red Ruthenia was the independent Duchy of Halych). The ducal seal of Vladislaus II of Opole (Władysław Opolczyk): "Ladislaus Dei Gracia Dux Opoliensis Wieloniensis et Terre Russie Domin et Heres" (c. 1387). The Red Cities region is central to the historic Red Ruthenia. During the early Middle Ages, the region was part of Kievan Rus' and, from 1199, the independent Kingdom of Galicia–Volhynia. It came under Polish control in 1340, when Casimir the Great acquired it. During his reign from 1333 to 1370, Casimir the Great founded several cities, urbanizing the rural province. The Polish name Ruś Czerwona (translated as "Red Ruthenia") came into use for territory extending to the Dniester, centring on Przemyśl (Peremyshl). Since the reign of Władysław Jagiełło (d. 1434) the Przemyśl Voivodeship was called the Ruthenian Voivodeship (województwo ruskie), centring on Lwów. The voivodeship consisted of five regions: Lwów, Sanok, Halicz (Halych), Przemyśl (Peremyshl), and Chełm. The town of Halych gave its name to Galicia.During the 1340s, the influence of the Rurik dynasty ended; most of the area passed to Casimir the Great, with Kiev and the state of Volhynia falling under Lithuanian control. The Polish region was divided into a number of voivodeships, and an era of German eastward migration and Polish settlement among the Ruthenians began. Armenians and Jews also migrated to the region. A number of castles were built at this time, and the cities of Stanisławów (Stanyslaviv in Ukrainian, now Ivano-Frankivsk) and Krystynopol (now Chervonohrad) were founded. In October 1372, Władysław Opolczyk was deposed as count palatine. Although he retained most of his castles and goods in Hungary, his political influence waned. As compensation, Opolczyk was made governor of Hungarian Galicia. In this new position, he contributed to the economic development of the territories entrusted to him. Although Opolczyk primarily resided in Lwów, at the end of his rule he spent more time in Halicz. The only serious conflict during his time as governor involved his approach to the Russian Orthodox Church, which angered the local Catholic boyars. Under Polish rule 325 towns were founded from the 14th century to the second half of the 17th century, most during the 15th and 16th centuries (96 and 153, respectively). Ruthenia was subject to repeated Tatar and Ottoman Empire incursions during the 16th and 17th centuries and was impacted by the Khmelnytsky Uprising (1648–1654), the 1654–1667 Russo-Polish War and Swedish invasions during the Deluge (1655–1660); the Swedes returned during the Great Northern War of the early 18th century. Red Ruthenia consisted of three voivodeships: Ruthenia, whose capital was Lviv and provinces were Lviv, Halych, Sanok, Przemyśl and Chełm; Bełz, separating the provinces of Lviv and Przemyśl from the rest of the Ruthenian voivodeship; and Podolia, with its capital at Kamieniec Podolski. Powiat of Żydaczów, (Powiat Żydaczowski), Żydaczów* Przemyśl Land (Ziemia Przemyska), Przemyśl; Its area was 12,000 km2. and in the 17th century it was divided five smaller regions (county, powiaty). Sanok County (Powiat Sanocki), Sanok: Intensive settlement occurred from the 13th to 15th centuries in an area flanked by the Wisłok, San and Wisłoka Rivers. The Vlachs primarily engaged in agriculture; moving west, they established a number of villages during the 15th century. In Sanok Land were six Jewish communities, with synagogues and kahal organizations. Sixteenth- and seventeenth-century Jewish Communities were also autonomous in criminal law. Village of Markowa, about 150-200 km southeast of Kraków. Its 18th- and 19th-century Upper Lusatian houses evoked the mountains of Saxony. Red Ruthenia (except for Podolia) was conquered by the Austrian Empire in 1772 during the First Partition of Poland, remaining part of the empire until 1918. Between World Wars I and II, it belonged to the Second Polish Republic. The region is currently split, with its western portion in southeastern Poland (around Rzeaszów, Przemyśl, Zamość and Chełm) and its eastern portion (around Lviv) in western Ukraine. Wikimedia Commons has media related to Red Ruthenia. ^ "The dominant population of Galicia, or Red Rus', called itself “Rusyn” ... and was considered by Russophile authors to be Russian, or, more specifically, Little Russian. That view began to gain ground after the publication in the empire of a Russian translation of Pavol Šafárik's Slovanský národopis in 1843." (Serhii Plokhy, Lost Kingdom: The Quest for Empire and the Making of the Russian Nation, New York, Hachette, p. 168. This page was last edited on 15 March 2019, at 01:24 (UTC).